Tom Suffredin sits at City Council meeting in May. The newly elected alderman has a family background in public service. When Tom Suffredin took office as the new 6th Ward alderman in May, he was helping usher in a “sea change” in Evanston politics. Suffredin, along with the two other new aldermen who were elected in May — Ald. Robin Rue Simmons (5th) and Ald. Cicely Fleming (9th) — are younger than many of their fellow Council members and bring with them different life experiences than their more seasoned peers. Tom Suffredin grew up in Evanston, left the city to go to college, and moved back to the 6th Ward in 2009, where he lives with his wife, Clare, and their four young children. He works as a contract lobbyist and makes frequent trips to Springfield for legislative work. His father was elected Cook County Commissioner in 2002, when his son was in law school at Loyola University Chicago. Tom Suffredin said public service was always a theme in his house growing up, and he learned the importance of accountability and responsiveness. 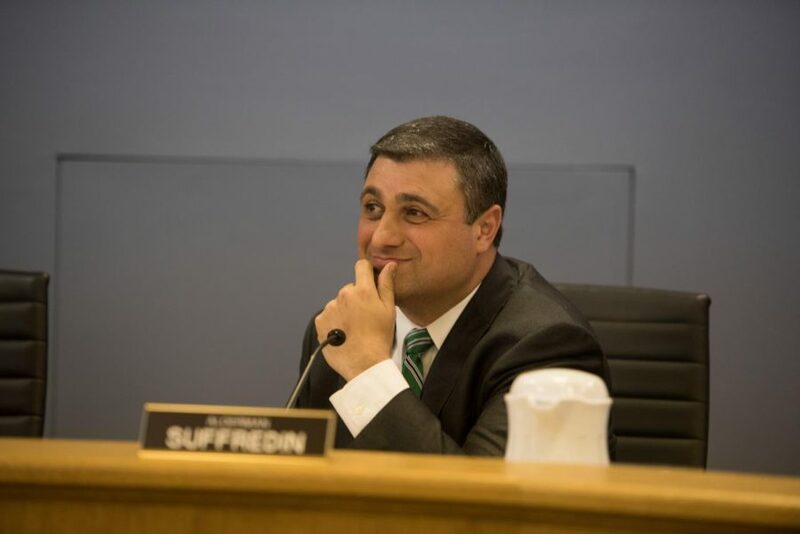 Suffredin said he knew that if he ever ran for public office himself, he would be a person his constituents would turn to and expect answers from. The concrete thought of running for office didn’t come until late last summer, after he helped sort out problems with a block party permit and said he was left frustrated. Around the same time, former 6th Ward alderman Mark Tendam was gearing up to run for mayor, a bid that proved unsuccessful but opened up a new seat on City Council. Tom Suffredin campaigned against Virginia Mann, a community activist and owner of a private public relations firm. During the campaign, Mann was endorsed by Tendam and Ald. Donald Wilson (4th). Suffredin, in turn, received endorsements from powerhouse politicians such as Rep. Jan Schakowsky (D-Ill.), State Sen. Daniel Biss (D-Evanston) and State Rep. Robyn Gabel (D-Evanston). He won the election in May with over 57 percent of the vote. Solving problems for residents and interacting with his constituents has always come naturally to Suffredin, said Erica Reardon, his longtime friend and campaign manager. She said one of his main priorities was to make sure he was responsive to his constituents and accessible as a resource. Reardon said they met people during the campaign who said they were having trouble getting answers and help, which further motivated Suffredin. His ward, which sits in the northwest corner of the city, is highly residential and faces traditional “nuts and bolts city service” issues like ensuring crosswalks and traffic lights are improved, Suffredin said. Reardon added that waste management and the minimum wage in Evanston were also priorities during the campaign. Since the beginning of the year, there have been increased talks in Evanston about equity, equal access, the role of police and diversity in the community. In response, Evanston recently hired Rev. Dr. Patricia Efiom as its equity and empowerment coordinator and has introduced measures to reform police procedure, including the implementation of body cameras on officers. But many, including Suffredin, say these efforts aren’t enough. In the last U.S. Census, Evanston counted about 40 percent of its population as people of color. That statistic differs by ward — some are highly diverse, while others, like the 6th Ward, are 90 percent white, Tendam told The Daily in May. Because of this disparity, Suffredin said he values shared spaces and facilities, like James Park, the Robert Crown Community Center — which is undergoing plans for reconstruction — and the Evanston Public Library, where residents called for an equity audit in May. Suffredin sees the role of City Council as less involved with the day-to-day running of the city, but rather a body of oversight and encouragement for new and existing programs. He took office amid budget negotiations on both a local and state level, as well as rising taxes due to the recently implemented Evanston/Skokie School District 65 referendum. He said it is a challenging time to be starting a term in office, but that Mayor Steve Hagerty had shown to possess the skills to deal with municipal financial matters. Even when dealing with city-wide issues, Larry Suffredin said his son stays committed to his own constituents and their specific needs.